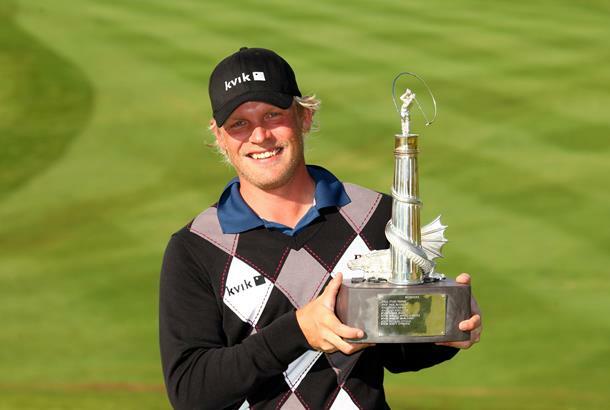 Denmark’s Jeppe Huldahl held off Niclas Fasth and Ignacio Garrido to secure his maiden European Tour title at The Celtic Manor Wales Open. The 26-year-old, who held the joint lead overnight, produced a nerveless display on the final day and didn’t drop a shot on his way to a superb 67 to finish on nine under. Fasth surged up the leaderboard with a closing 66 to finish a shot back on eight under, while Garrido finished on seven under after a double bogey at 16. Huldahl’s performance was all the more remarkable considering he had never previously finished in the top ten on the Tour. He becomes the ninth first-time winner on the 2009 European Tour schedule and follows Steen Tinning (2000), Simon Khan (2004) and Scott Strange (2008) as players to make The Celtic Manor Wales Open their first European Tour victory. Birdies at three, eight, ten and 11 put him clear at the head of the leaderboard, and although Fasth briefly drew level on the back nine, Huldahl held his nerve to finish with seven straight pars. He said: “It feels amazing. I don't know what to say to be honest. I didn't even dream of this coming into this week. “I couldn't feel my hands on the last three holes. I knew I was doing well, but I didn't know how well until I asked my caddie on the 18th tee. Fasth picked up four birdies and an eagle to move from three under to nine under after 15 holes, but back-to-back bogeys on 16 and 17 proved costly for the Swede. He held an impressive putt on the last to post 66 and move back to eight under, but ultimately it was to no avail. “I was playing pretty decent golf, a little bit of a mixed bag this week,” said Fasth. “But what's happened is the putting has come around, and I changed to a new Odyssey putter.